IFORCE Dexaprine XR Review – Is it any good? 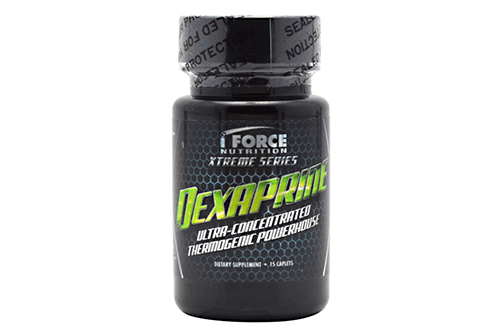 Dexaprine XR is a fat-burning thermogenic supplement developed by IFORCE. Dexaprine XR claims to be the top choice in fat burning thermogenic supplement category by combining appetite suppressants, energy boosters with thermogenic ingredients. A quick Google search about Dexaprine XR and you’d likely encounter pages that would warn you about the potency of Dexaprine XR. Whether or not this is genuine, it’s an effective marketing campaign that brings more customers to buy Dexaprine XR. The idea is to warn customers so much that they eventually pay attention to what the product is. In fact, there is even an entirely new website dedicated to warn customers about the use of Dexaprine XR. The owner of the website even claims that they do not work for Dexaprine XR or IFORCE, but you can clearly see that everything on the website is about Dexaprine. While having a website to warn people about your own product is sketchy, a lot about Dexaprine XR fits the cookie-cutter world of fat burning supplements. It contains just about every common ingredient that every other fat burning supplement has. Is there something about Dexaprine XR that we’re missing? In this review, we’ll take a closer look at Dexaprine XR to know more about its uses and side effects. Many of those who have used Dexaprine XR noted that it’s the stim effect that got to them the most. They felt more motivated to work out and accomplish what they had planned for the day. This is a good sign for the product. This could be attributed to caffeine and acacia rigidula, which are the main ingredients of Dexaprine XR. Like many other supplements that contain caffeine, its effects are easily noticed by the users. Enhanced cognitive functions and energy are noticed after taking Dexaprine XR. As effective as it is, there are also many users who have complained about the effects of caffeine on their body. Some reported jitters, palpitations, and hypertension. Users also lauded the effects of Dexaprine XR for appetite suppression. Some users even had to set reminders to eat. Of course, like many other appetite suppressants, the effects wear off after a while – and when it does, you’ll need another dose. This may be a problem if you usually take the first dose in the morning, and late in the afternoon its appetite suppression effects would wear off. Taking another pill would mean that you would have to endure its caffeine effects until it wears off and allows you to sleep. Of this lineup of ingredients, Acacia Rigidula may cause the most problems. Acacia Rigidula has been regarded as the “Meth Tree” with effects that mimic those of methamphetamine HCl. This may cause a problem if you get screened for drug use. Overall, the effects of Dexaprine XR may be too potent for some. At its recommended dose, many users have already experienced side effects. Take caution when using Dexaprine XR. If you want an all-natural way to lose fat, try a colon cleansing solution with Flat Belly or Garcinia Cambogia (Garcinia X).